Looks: What beautiful weed should look like. The picture really doesnt do this one justice. 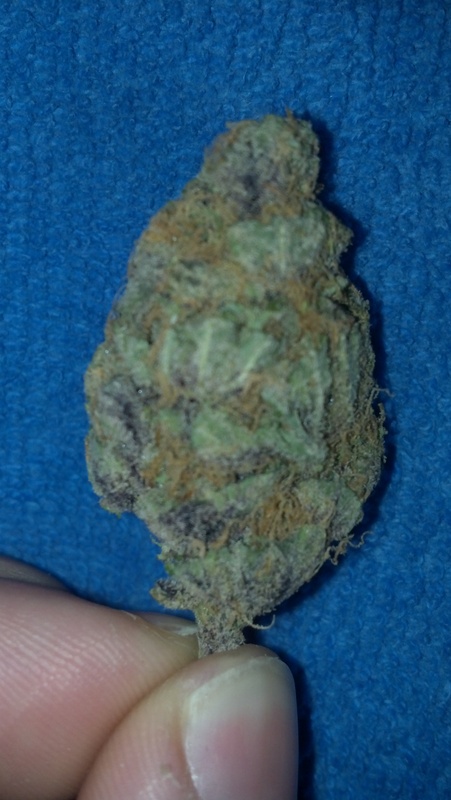 Thick dense nugs that seem to have a powered sugar coat, nice orange hairs that creep through, plus just beautiful purple undertones that mix in with the oh so pretty green. 10/10 for looks. 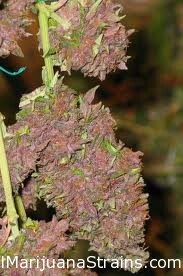 Smell: First sniff of this nug and you just know you got some great weed. Very unique berry smell. How Blue Dream is unique to a blue smell, this is just as unique to a yummy black cherry smell. Smell 9/10. Taste: Taste is almost exactly like the smell. VERY unique berry taste on the inhale, and a nice cream soda taste on the exhale. Taste just gets better with each bong hit. Taste 9/10! Effects: Starts off in the back of the head and behind the ears, very cerebral to start. With a few more bong hits this really starts to get into the shoulders. Very nice surprising upper body tingle! Packs a great sativa punch, with just a slight indica kick to give the body a great sensation also! Very uplifting! Potency: 9/10 on potency. K.O. sativa power, with that slight indica kick. Dont pass up the opportunity of getting to try this one!!! Good Strain For: Mid-day use is great, great for some good music, very uplifting high.